A previous post pointed out that some existing mapping of surficial deposits at 100k was inadequately detailed for the purposes of this project. We quickly made that assessment by draping the linework on imagery viewed in Google Earth and in ArcGIS. It is very likely that had the various geologists who developed this mapping over the years had such easy access to high-resolution imagery and GIS, then the mapping would be considerably less inadequate! 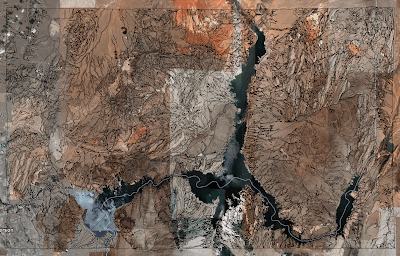 The example above shows the lines from the Lake Mead 100k map (USGS open-file data) in Google Earth. It works very well when zoomed into specific areas (down to 1:6000, for example), but the overall heterogeneity of the base imagery is a bit distracting. From this image (and the next) you can see that the detail in the bedrock is somewhat to considerably greater than that in the 'dirt'. 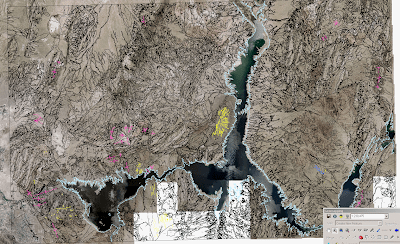 The image below is from ArcGIS and the lines from the Lake Mead 100k sheet are overlain on NAIP imagery. This imagery is also great when zoomed in and is homogeneous with respect to overall color balance, tone, etc. It is also from a much smaller window of time. 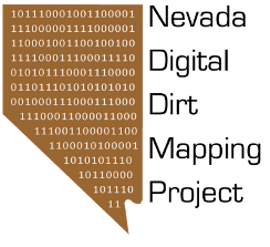 Our team has recently set up an image service at the UNR Geospatial Lab (Geography Dept.) that allows each investigator on the project to access the same high-resolution imagery remotely. Thus, we do not have multiple copies of giant .tiff files on all of our various computers. This is extremely helpful for collaboration and ensuring that everyone has equal access to the base imagery.